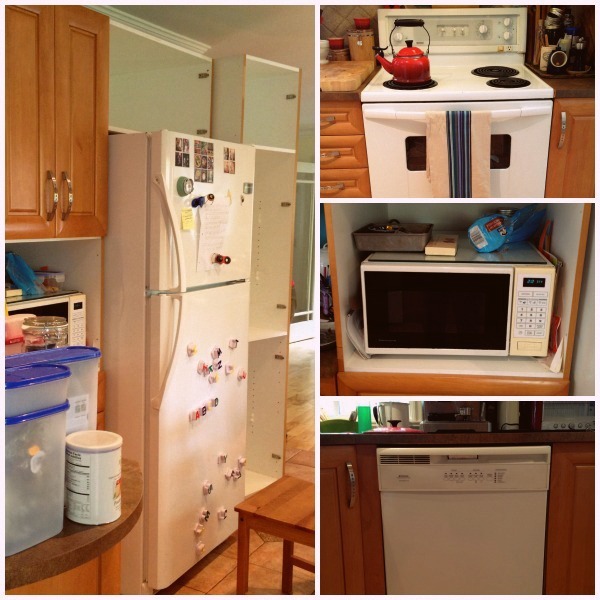 But first…the ‘before’: the second-hand appliances to which we happily bid adieu. I burned countless trays of cookies in that oven and the refrigerator always froze the edges of my produce. In a recent development, the dishwasher door had to be closed with a hip check, and that microwave wasn’t big enough for a casserole dish. Now any dishwasher is better than none, I acknowledge that, but these old appliances had served their term. I’m now working in a freshly updated space with top of the line appliances generously provided by KitchenAid Canada. We renovated two areas in the kitchen to accommodate the shiny new appliances – over the Thanksgiving long weekend, no less. I’ll share more about what we did in two upcoming posts featuring the free-standing range and the French door refrigerator. 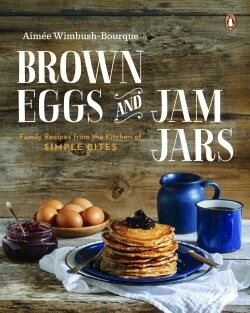 I was thankful we didn’t have to renovate anything major, as I am up to my ears in recipe testing for the Brown Eggs and Jam Jars cookbook. I love my kitchen, with its double windows, thoroughfare center, and bookended by a jam pantry and a bar. Well, let’s look some more. Believe it or not, I still run out of counter space. This bar is on the left as you enter the kitchen from the main door. It’s my favorite spot to put out a punch bowl and finger food at parties because it keeps people away from the stove, where I am working! That same, sunny bar is also my morning work zone, where I perch with a coffee and answer emails chat on Twitter. One con? It’s such a handy drop spot, it is forever cluttered. Near to my beloved corner sink, is the hardest working appliance in the kitchen. You can probably guess. 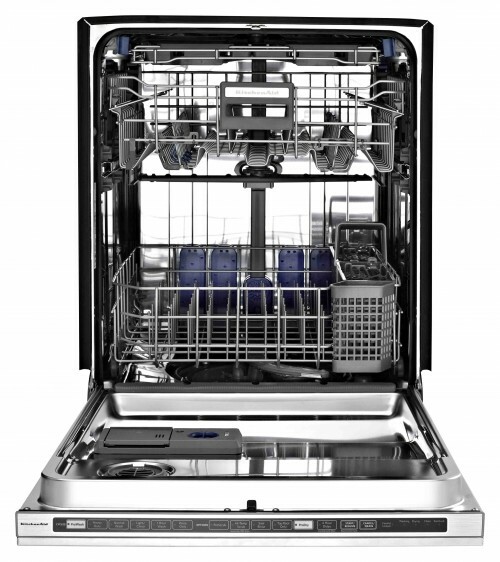 The new KitchenAid Superba® Series EQ Dishwasher is up for the task of keeping up with my output of dirty dishes, and thank goodness it is, because I fill it twice daily and sometimes more. I could go on and on about its unique features (So. QUIET!) 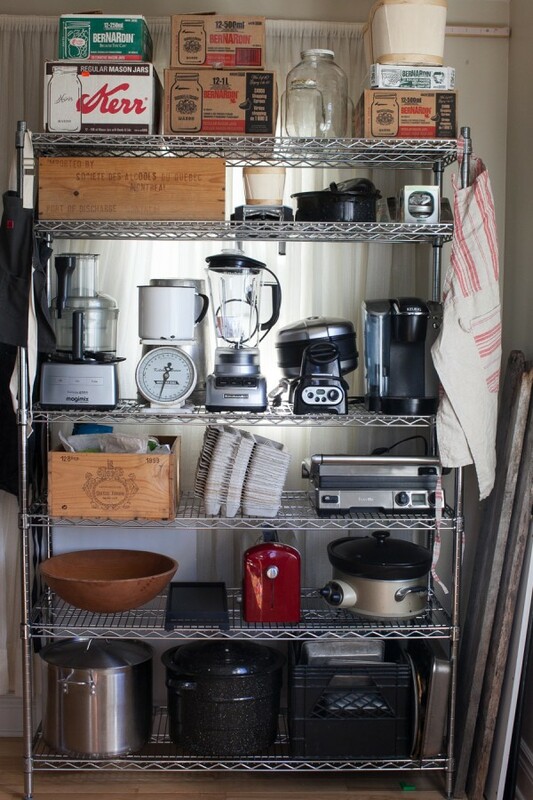 but my one of favorites has to be the third level Culinary Tool Rack that I make good use of. It’s been fantastic for canning rings, which I dislike washing by hand. Also? I love that the button panel disappears when the door closes; Clara used to walk by our old dishwasher and turn it on! Yikes. All right, at the end of the long counter under the window, is where things really heat up….finally, I’m cooking with gas! 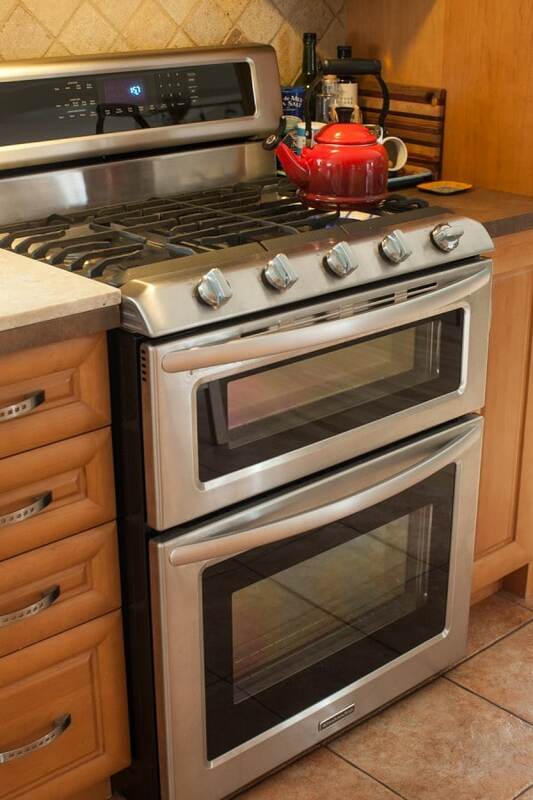 Look for a post tomorrow with all the details on this KitchenAid, 5-Burner Freestanding Double Oven Range. It feels like it was built specifically for my space and my needs. I am already making good use of the double ovens for all my recipe testing and the fifth oval burner has been exceedingly handy for late fall canning projects. The range is a beauty, but more importantly, its performance meets my daily demands with no complaints. I think this is the beginning of a beautiful friendship (name that movie!). Spin around 180 degrees from the stove and I have a peninsula counter, handy KitchenAid countertop microwave and…my new best friend. I’m trying to remain calm and walk you through my kitchen without using words like ‘obsessed’ and terms such as ‘in love’, but it is really hard to hold back when talking about this wonderful (here I go…) refrigerator that I still can’t believe is occupying my kitchen. This 29 cu. 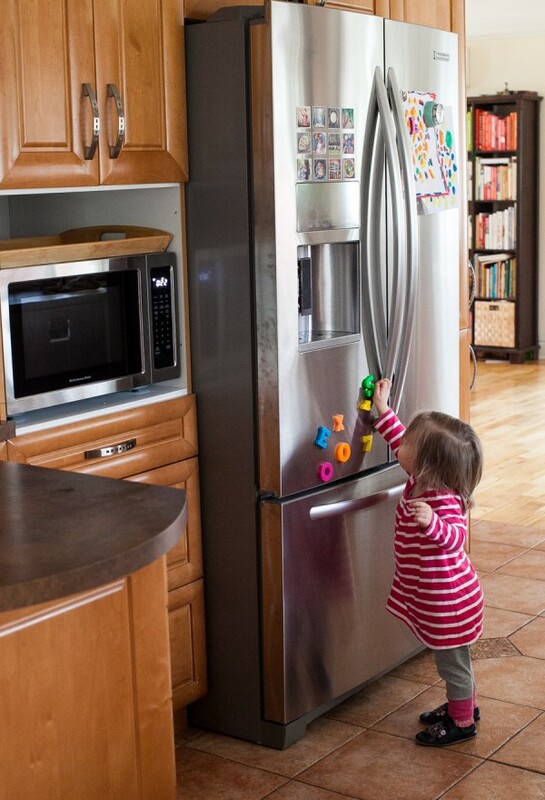 ft. standard-depth French door refrigerator is KitchenAid’s Architect® Series II. Yep, that’s quite a title, but this fridge does it all from instantly grinding ice for margaritas (dangerously enabling, I tell you) to its Preserva® Food Care System that noticeably keeps produce fresher for longer. And then there is the freezer. After managing with a top door freezer for forever, I am *loving* the pull out freezer with three drawers on the refrigerator. My preserved summer produce and baking supplies are now super handy to reach. No digging with frozen fingers required . Get the full fridge and freezer tour on Thursday when I am swinging open those doors and drawers! This side of the kitchen opens on to the dining room (which we’ll tour on Wednesday) and is a hub of all sorts. The children frequently push up chairs to assist in mixing up baked goods with our KitchenAid stand mixer, so the counter is usually dusted in flour. When I entertain, I set up the self-serve coffee bar on the lower level counter, again, to keep folks from congregating right in the kitchen! 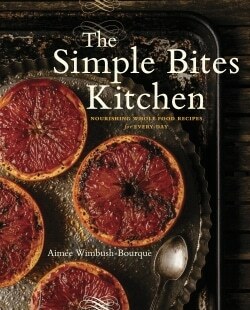 It’s also a sweet spot to browse cookbooks and get inspired. I usually have two or three within reach, and the rest take up residence on the living room bookshelf. Color coordinated, of course. Just two storage spaces and we will wrap up this part of the kitchen tour. I couldn’t leave out my beloved preserves pantry. It was designed, I imagine, to hold delicate stemware and Royal Doulton figurines, but I prefer it like this. 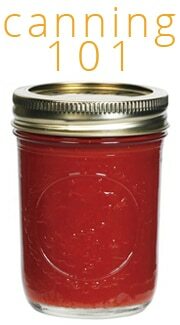 Pickles, jam, fruit butter, pizza sauce, salsa, relish, chutney….it’s going to be a sweet, tangy and tantalizing winter. Below are what I am calling my ‘Homesteading Shelves’. A blocked off, unused entrance was always an awkward corner of empty space until I picked up an industrial shelf from Costco, attached it to the wall for safety, and loaded it up with all the useful items that were cluttering up my kitchen counters and contributing to cupboard sprawl. Canning jars and pot, small appliances, egg cartons, bulky pans and even a few food photography backgrounds now have their very own space. I find I am using everything far more now that it is readily accessible…and my kids are happy about more waffles. So concludes the first instalment of the kitchen tour! Thanks for sticking around to the end. As you can see, a lot happens in this space, so this visit was bound to go into overtime. See you tomorrow when we will heat things up with a closer look at that dual-fuel range and all its bells and whistles. 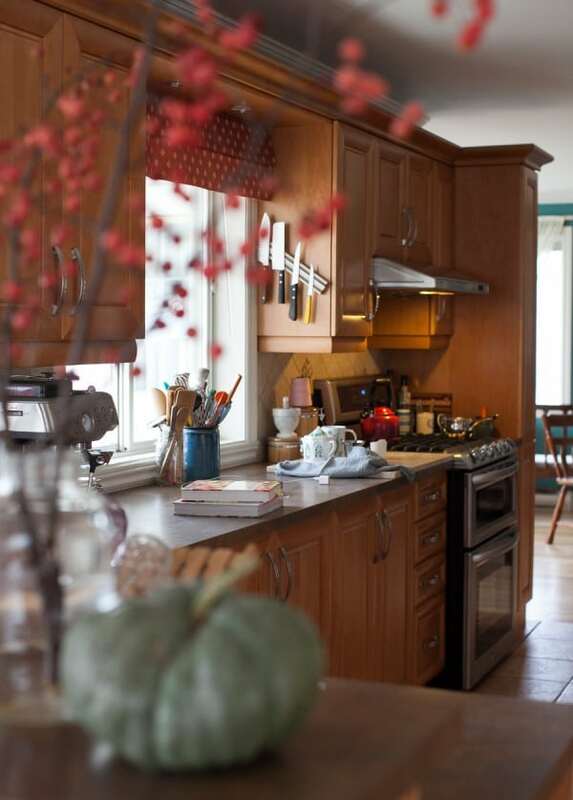 We have a breakfast bar-type perch in our kitchen too – also mostly covered in stuff BUT it saves that stuff from cluttering our countertops – which it did before – so I forgive it. Robin, wonky is the perfect description! What a beautiful kitchen! We recently moved overseas and had to downsize our kitchen big time. While I made it work for me, I still miss an enormous kitchen like yours. There are no kitchen parties in Asia! Thank you so much for sharing. So interesting, Kerry. So where do people hang out? I’ve traveled bit in SE Asia, and the weather was so lovely, we were usually socializing on lush verandas and balconies. wow, It all looks amazing. I’m waiting for my current refrigerator to bite the dust (I’ve hated it since we got it), so I can get one just like yours!! My only concern is your jelly cupboard, every post I’ve read says you should take the rings off the jars and not to stack your canned items because if the lid pops off, you won’t know and might unknowingly eat contaminated foods. I’m curious – why all the egg cartons? Hey Debra, We keep a flock of six layers that give us an egg a day each. We love to share the fresh eggs and go through quite a few egg cartons over a season. Love it! You lucky lady! So fun to see your kitchen and beautiful new appliances! I know what’s on my list when our dishwasher gives out! Hi Heather. The dishwasher seriously rocks. The only ‘con’ we’ve found is that the second rack has a mind of its own and likes to slowly sliiiiiiiide open when you are loading the bottom rack! But seriously, it so quiet and does a super job of cleaning. WOW! Love everything about your kitchen! Enjoy! Your new kitchen is lovely! I am encouraged you are enjoying your KA appliances. I have a French door fridge and dishwasher in my garage waiting for our extensive reno to get to the appliance install point. 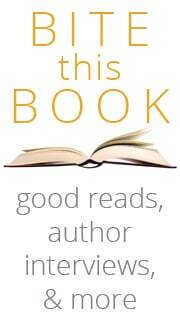 I did a lot of research and felt very confident with all the positive reviews on KA. Ah, the Costco industrial shelves…lifesavers. I have 2 right now that are my kitchen on wheels while we renovate. Would have lost my mind these last 6 months without still having my basics at hand. Enjoy your new space, and thank you for sharing with us. Exciting for YOU! Hang in there; renos are exhausting. How exciting!!! I can’t imagine how nice all those updates must feel. 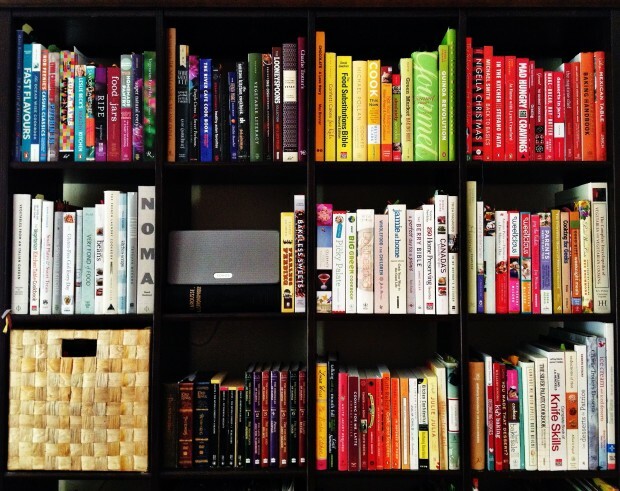 I am in shock and awe over those preserves and LOVING the color coordinated cook book collection! That’s essential what we did, Martinique. You can read all about the conversion tomorrow. Wow it is beautiful! I am so happy for you! oh my goodness! I’m so jealous!! I want to move right in and never leave!! It’s BEAUTIFUL! Aimee, it’s stunning! 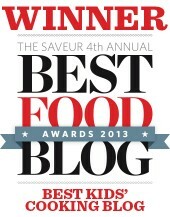 Love the preserves pantry… swoon! What a fabulous kitchen! I can feel the happiness it contains in every photo you’ve shown us. Congratulations and enjoy! It looks fantastic! What a gorgeous space for all the work you do. And those appliances have me swooning. . . oh dear. Your kitchen looks wonderful. Those appliances are beautiful! 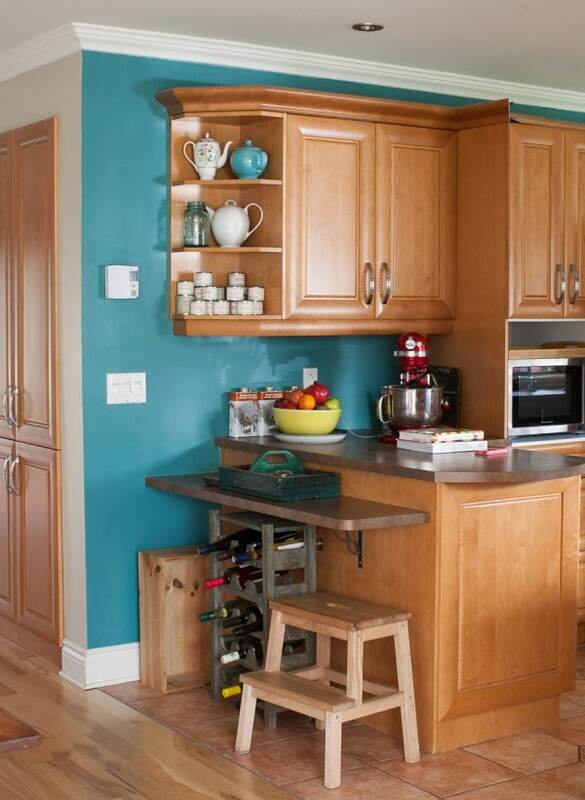 I love your kitchen perch and your anecdotes about how your space is actually used! I have three roommates and our freezer feels like a death trap, each time I open it I am worried the whole lot will tumble out on me. 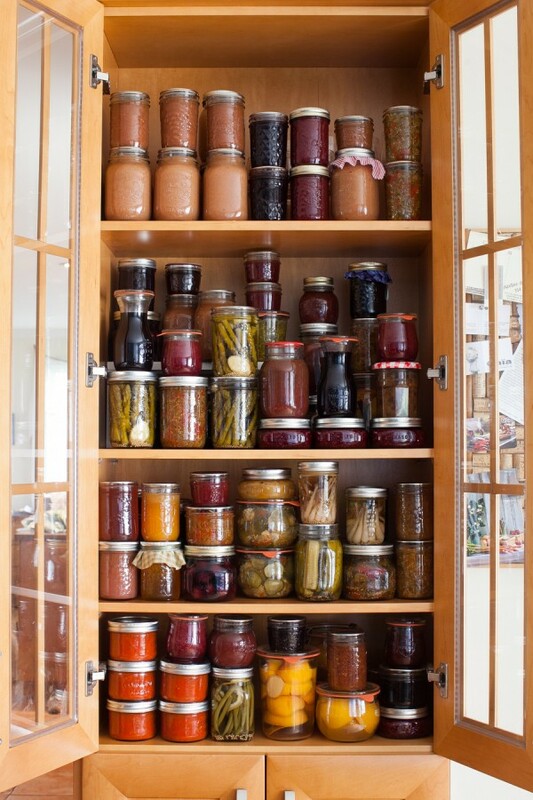 I am still in such awe of your canning cupboard, now that’s real love at first sight. I know the feeling, Taryn! My previous freezer was in constant disarray. Love the new kitchen. I too have stainless but the next go around – I’m going back to old fashioned white. Black shows dust (I live in the desert and it is everywhere) and stainless shows fingerprints and water spots. The only thing that would make me change my mind is to be able to afford the retro units that would look great in my old house. I wish there were more options for refrigerator only because I have a huge standing freezer. I knew you’d love the double oven in the range – so handy. Wow. I think my kitchen is 1/4 the size of yours. I love all the space you have, and the new appliances really changed the feel of the room. I would be skipping through there if I were you, too. What a gorgeous kitchen, Aimee! Way to go. And I looooooove that oven. Seriously drooling. I’ve wanted one of those for a long time. Funny! She leaves them alone (knocking on wood), surprising, I know! The exact same thought went through my head when I was taking the tour – wine would be all over the place if my little guy was let loose in your kitchen. 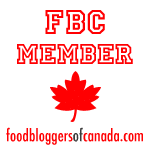 Hi Aimee, I love the kitchen renos and the appliances as well. I just noticed in your refrigerator small mason jars. I would like to know how you can freeze or proceed with the freezing. Good question, Nancy, I’m going to talk about it in an upcoming post (Thursday) where we tour my fridge and freezer! When we moved here and bought our first home (after years of moving from base housing to base housing) a gas stove was high on my list. I was delighted to get a Kitchen Aid floor model for half price (though the cost of running the gas line from the furnace room to the kitchen ate up the savings–ouch!). I can’t believe you did that over Thanksgiving weekend. Crazy! 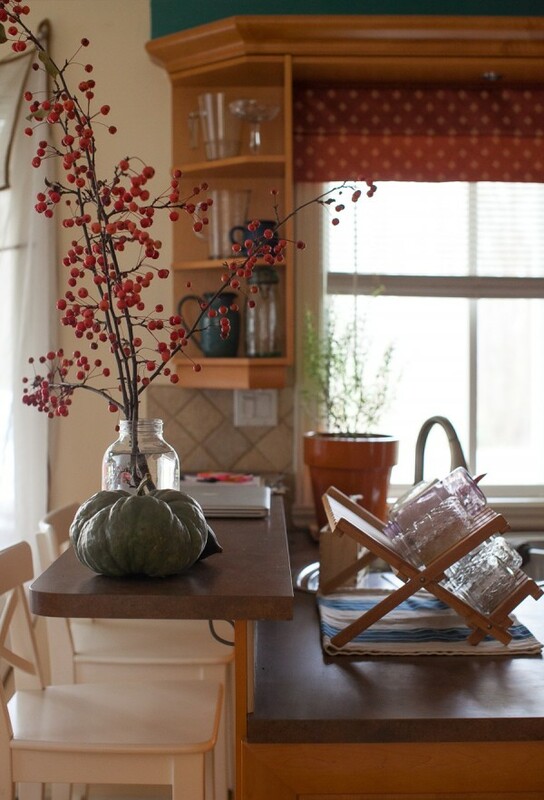 I love how you’ve showcased your preserves pantry–what a far better use than displaying rarely used fancy pieces! Hi. everything looks beautiful. I had the same dual fuel oven and LOVE it. But I also had the same fridge and had huge problems with it. I loved the idea of it but had constant problems with the ice maker. 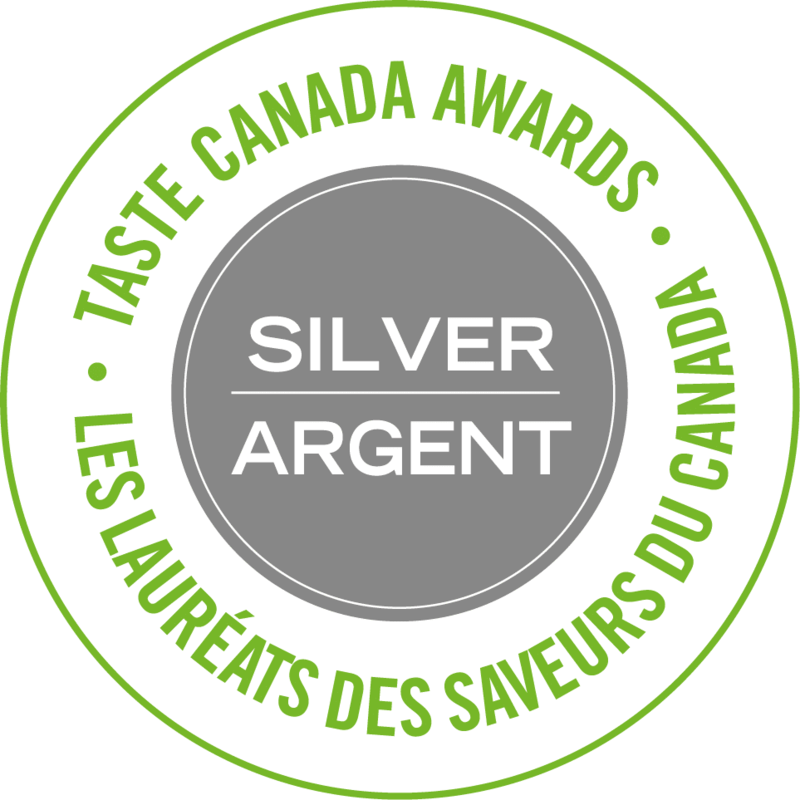 I was lucky to get it from a great appliance company (Bergmann Appliance in Slinger, WI) who took care of us. We went thru 3 of the same refrigerators and finally replaced it with the 25 cf refrigerator since the problem never went away. I hope that you have better luck than we did with the beautiful refrigerator and huge freezer. And I really wish that KitchenAid would get their act together on that fridge because we have to buy one for our new house and, after our experience with this, there’s no way that I’ll buy the same one again – which makes me sad. I don’t mean to be a downer but I just wanted you to be aware of a. If problem out there with one of your products. 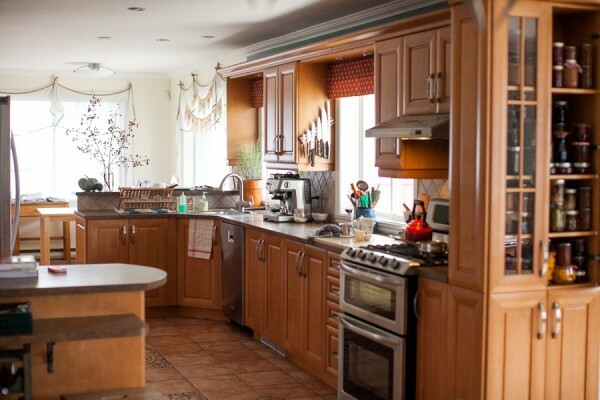 The renovation looks great and I love your website, writing, and recipes. We have a similar new fridge that I love — it’s a Samsung french-door refrigerator, a fridge drawer below that (great for trays for for a mini wine fridge), and a freezer on the bottom with double interior drawers and a small rack up front for those things you always lose. (I think it’s the Consumer Reports best buy, too!) but So worth it after our LG died the third and final time, after only 2 years. Aimee, the appliances look amazing in your pretty kitchen! That gas range… I know what you mean about trying not to use words like “obsessed” and “in love”! Looking forward to the next kitchen posts! Having seen it in its sparkly new state, I can say with 100% certainty that your kitchen rocks! Awesome. I’ll keep working on it! And you’ve obviously never played hockey with me. My secret weapon is shin slashing. It looks fantastic! And i love the color of your walls!! 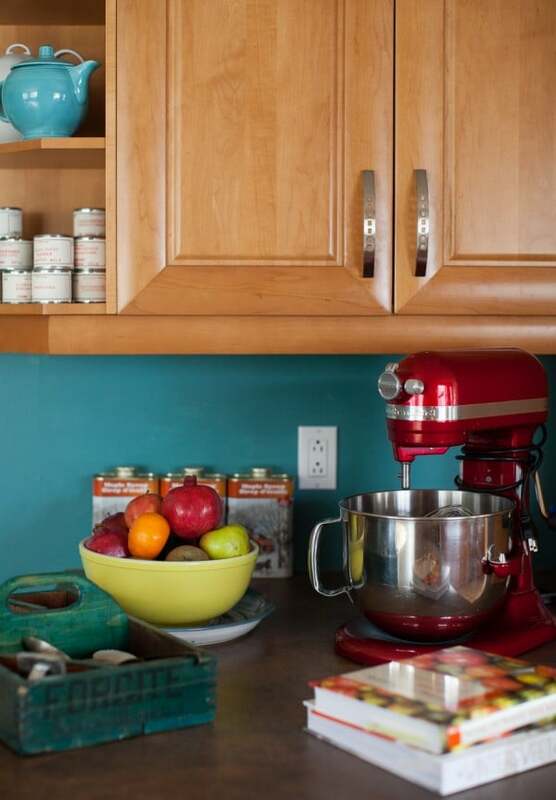 Please share that color – it would go perfect in my kitchen. That is gorgeous. Love the jam storage. My only concern is the rings and stacking on them. I saw you while someone from CTV was interviewing you about your chickens and I saw movers unloading your spanking new appliances in the background. I say I am seriously envious…top quality appliances and you’re able to cook with gas in Montreal…really envious! Fantastic upgrade! I love the space and how you still get some really great light, something that my kitchen seriously lacks! It’s decent light, yes. Thanks for commenting! Aimee, I’m so glad you went with the double oven and bottom drawer freezer. If I could do anything over again, it would be to get a double oven instead. My Breville smart oven somewhat makes up for it, but nothing will ever truly replace a whole second oven. It looks beautiful! Thanks for all your help, Amber! Seriously good advice. I just posted a closer look at the range. It’s a beast! WOW. I am so jealous of your preserves pantry! I also really love your raised counter with stools and your lower one on the other end, really creative use of space there. I have been eyeing that oven/range for a few months now! We moved 2 months ago and I despise the appliances in my new kitchen. Looking forward to reading the rest of the posts in this series…I need inspiration!! OMG AMAZING!!!! Every part of it. Those appliances make your kitchen makeover night and day. I must say your cabinets full of jars made me smile HUGE!! 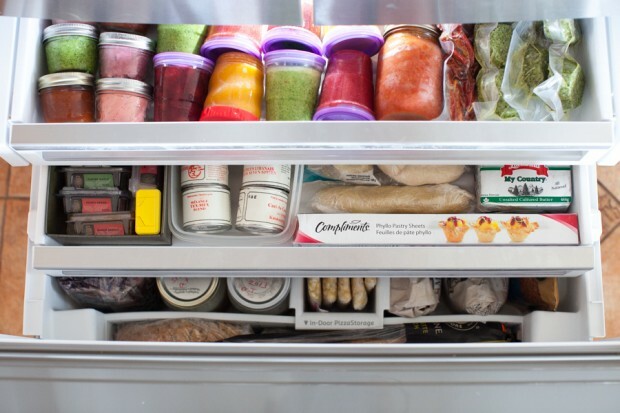 Oh my gosh, isn’t having a bottom drawer freezer life-changing? How did we live so long without one? And – can you come over and curate my pantry?